The cut-off date for eligibility for the awards was April 30, 2009. Nominations were announced on May 5, 2009 by Cynthia Nixon and Lin-Manuel Miranda. Of the musicals, Billy Elliot the Musical received 15 nominations that was the most it was eligible for, which at the time tied for the most received by any Broadway production until surpassed by Hamilton, followed by Next to Normal with eleven. Among the nominees for Best Revival of a Musical, Hair had the most nominations, with eight. Of the plays, the revivals Mary Stuart and The Norman Conquests tied for the most nominations, with seven each. All four stars of God of Carnage were nominated, as was the play itself. The Isabelle Stevenson Award, a non-competitive award named after the late president of the American Theatre Wing, was presented for the first time. Its purpose is to recognize individuals from the theatre community who have volunteered time to one or more humanitarian, social service, or charitable organizations. The first recipient of this honor was Phyllis Newman. This was the first non-competitive category to be introduced since the Tony Honors for Excellence in the Theatre was established in 1990. The broadcast won the 2009 Primetime Emmy Award for Outstanding Special Class Programs. The telecast also was nominated in the category of Outstanding Art Direction for Variety, Music or Nonfiction Programming. The Visa Signature Tony Awards Preview Concert featured performers from the musicals Guys & Dolls, Hair, West Side Story, 9 to 5: The Musical; Billy Elliot, The Musical, Next to Normal, Rock of Ages, and Shrek The Musical. The concert was televised on various CBS stations, and in New York City on May 30. Newscaster Harry Smith from The Early Show hosted the special. The red-carpet arrivals and pre-Tony telecast awards (Creative Arts Awards) were webcast on TonyAwards.com. A Creative Arts Awards (CAA) ceremony, hosted by Laura Benanti and Brian Stokes Mitchell, was held prior to the main ceremony. The CAA presented the awards for orchestrations and scenery, costume, lighting and sound design. Presenters included Lucie Arnaz, Kate Burton, Kristin Chenoweth, Jeff Daniels, Hope Davis, Edie Falco, Will Ferrell, Carrie Fisher, Jane Fonda, Hallie Foote, James Gandolfini, Lauren Graham, Colin Hanks, Marcia Gay Harden, Anne Hathaway, Jessica Lange, Frank Langella, Angela Lansbury, Audra McDonald, David Hyde Pierce, Piper Perabo, Oliver Platt, Susan Sarandon, John Stamos and Chandra Wilson. Performances included scenes from nine Broadway musicals: Billy Elliot the Musical (with an appearance by Elton John); Guys and Dolls, with Tituss Burgess and company performing "Sit Down, You're Rockin' the Boat"; Hair, with the company performing the title song and "Let the Sunshine In"; Next to Normal, with Alice Ripley, J. Robert Spencer, and Aaron Tveit performing "You Don't Know/I Am The One"; Pal Joey, represented by Stockard Channing singing a few lines from "Bewitched, Bothered, and Bewildered" during the opening segment; Rock of Ages, with Constantine Maroulis and fellow cast members singing "Don't Stop Believin'"; Shrek the Musical, with the company performing "What's Up, Duloc" and "Freak Flag"; West Side Story; and 9 to 5, with Dolly Parton joining the cast to sing the title tune. Cast members from national touring companies of three musicals also appeared: The lead character from four Jersey Boys casts (Joseph Leo Bwarie (Toronto), Rick Faugno (Las Vegas), Courter Simmons (national tour) and Dominic Scaglione, Jr. (Chicago)) sang together with Jarrod Spector from the Broadway cast; Legally Blonde The Musical spotlighted Becky Gulsvig; and Michelle Dawson, Kittra Wynn Commer and Robin Tyler from the Reno, Nevada production of Mamma Mia! sang "Dancing Queen" with fellow cast members. Performers from the nominated Best Plays category presented brief clips of those plays, which included God of Carnage, 33 Variations, Dividing the Estate and Reasons to be Pretty. Liza Minnelli performed in the opening sequence, and rock singer Bret Michaels and his band Poison joined the cast of Rock of Ages during their segment in the opening number, performing its song Nothin' but a Good Time. While exiting the stage, Michaels was struck in the head by a descending set and knocked to the floor. He suffered a fractured nose and a split lip that required three stitches. He subsequently sued the event's organizers, claiming that the collision led to his 2010 brain hemorrhage. The suit was settled in May 2012 for an undisclosed amount. Neil Patrick Harris ended the show with a pastiche of "Tonight" from West Side Story and "Luck Be a Lady" from Guys and Dolls, with lyrics re-written by Marc Shaiman and Scott Wittman that recapped the awards. Marc Kudisch – 9 to 5 as Franklin Hart Jr.
↑ Gans, Andrew (May 14, 2009). "Neil Patrick Harris to Host 63rd Annual Tony Awards". Playbill. Archived from the original on 18 May 2009. Retrieved 2009-06-08. ↑ Gans, Andrew (December 4, 2008). "Tony Rulings: American Buffalo Ineligible for Nomination". Playbill. Retrieved 2009-06-08. ↑ Gans, Andrew (January 9, 2009). "2009 Tony Award Nominations Will Be Announced May 5". Playbill. Archived from the original on 30 April 2009. Retrieved 2009-06-08. ↑ Jones, Kenneth; Andrew Gans (May 5, 2009). "Nominations for 2009 Tony Awards Announced". Playbill. Archived from the original on May 8, 2009. Retrieved 2009-06-08. ↑ Gans, Andrew (October 8, 2008). "Tony Awards to Present Isabelle Stevenson Award in May 2009". Playbill. Archived from the original on 2008-12-11. Retrieved 2009-06-08. ↑ Gans, Andrew (May 30, 2009). 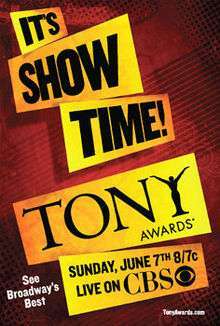 "Tony Awards Preview Concert, Hosted By Harry Smith, Airs May 30". Playbill. Retrieved 2009-06-08. ↑ Gans, Andrew (May 27, 2009). "Tony Evening Will Begin with Red Carpet Arrivals and Pre-Telecast Awards". Playbill. Retrieved 2009-06-08. ↑ Gans, Andrew (June 4, 2009). "Benanti and Mitchell to Host Creative Arts Tony Awards Presentation". Playbill. Retrieved 2009-06-08. ↑ D'Zurilla, Christie (May 15, 2012). "Bret Michaels, Tony Awards settle lawsuit over 2009 injuries". Los Angeles Times. Retrieved May 21, 2012. ↑ Gearty, Robert. "Poison singer Bret Michaels to settle lawsuit over accident at 2009 Tony Awards". Daily News. New York. Retrieved May 15, 2012. ↑ "Tony Award Winners". Retrieved 2009-06-08.